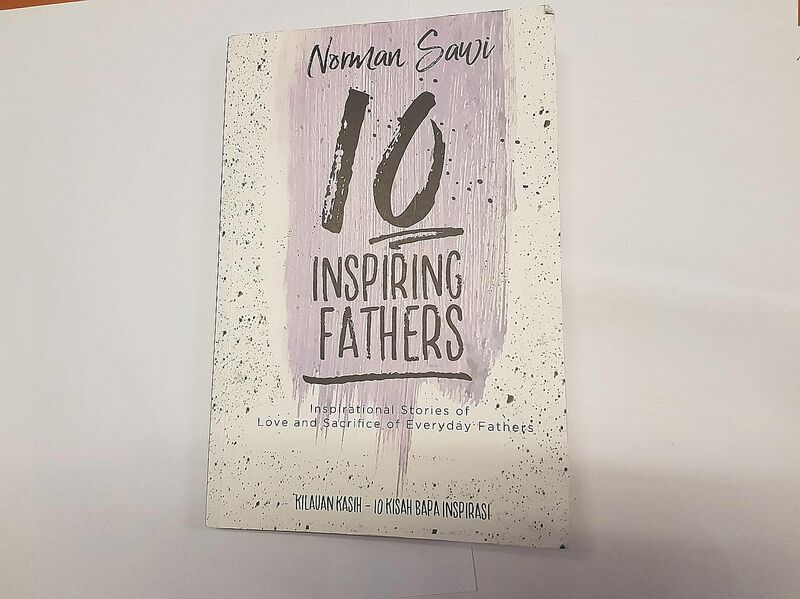 When Norman Sawi, a journalist at the Berita Harian newspaper, wrote the bilingual book 10 Inspiring Fathers, he was struck by what the different fathers profiled have in common. The book, published late last year by The Straits Times Press, features the Mufti of Singapore, Dr Mohamed Fatris Bakaram. A mufti is an Islamic scholar who helms the religious leadership in a Muslim community. It provides a glimpse of the private side of this public figure as a compassionate father who believes in spending quality time with his children. It mostly, however, features ordinary fathers who are not famous names - one who worked a few jobs to support his family, another who fought kidney failure, diabetes and other ailments and cherishes his time with his children. Norman, 37, wrote the book, which is in Malay and English, with the help of the Association of Muslim Professionals and the Centre for Fathering. He says it is aimed at the wider Singapore community. The two organisations, which provide parenting tips in the book, are partnering Berita Harian, the local Malay daily, to promote fathering, especially in the Malay community, says Norman, who is married with a two-year-old son. He adds: "The common bond the fathers in the book have is that they are always driven by their love for their families." Mr Mohammad Ali Dawood, 47, and his wife, Ms Faraliza Zainal, 46, opened a special needs school as their firstborn son was autistic, but wanted a religious education. MIJ Special Education Hub, which they started in 2011 offering weekend Islamic classes to 13 students, now has about 250 students. It provides children and young people with special needs a holistic education, including lessons on matters of faith and moral values, as well as training in life skills such as learning how to take public transport. Besides autism, Mohammad Ashraf, 18, the eldest of their three children, has a genetic disorder called tuberous sclerosis. He has fits, especially when he is stressed or anxious, as a result of this disorder, which is characterised by the growth of numerous non-cancerous tumours. Ashraf was bullied when he was in Primary 3 because he could not socialise well due to his condition. "He was crawling into the classroom because of trauma issues, so we decided to take him out," recalls Mr Mohammad Ali, a regional sales director in the aviation industry. Ashraf spent some years at a private school, followed by Pathlight School, both of which cater to children with autism. He took his Primary School Leaving Examination at Pathlight, but did not score high enough to move on to secondary school. He was not interested in vocational training. He told his parents, who have two younger children aged 16 and 11, that he wanted to do more religious studies. Since he was about seven, he enjoyed going to weekend religious classes. However, attending them with his younger sister was challenging because their peers would ask what was wrong with him or tease him if he displayed unusual behaviour. "We opened a school for him because of his condition and interests. "We've also seen many parents with children with special needs who were lost and did not know what to do. We want to help them," says Mr Mohammad Ali. When he was nine years old, Mr Mohamed Nor Ismail started sniffing glue. By the age of 13, he had moved on to cannabis and, a few years later, he was taking heroin. Mr Mohamed Nor, 47, is the 12th of 13 children. His late father was a taxi driver who worked 16-hour days, while his late mother was a housewife who had her hands full caring for the large brood. Mostly left to his own devices, Mr Mohamed Nor fell in with the wrong crowd as a child. He even got three tattoos as a gang member - two of which he has removed. From the time he was 20 until the age of 31, he was in and out of the Drug Rehabilitation Centre. During those 11 years, he served prison terms ranging from a few weeks to three years on drugs charges. When he left prison in 2001, he wanted to turn his life around. "Being a drug addict or gangster was some sort of no life. Most of the time, I would be inside the toilet (taking drugs)," he says. "Everywhere you go, you feel scared." He was always watching out for white passenger vans used by security officers, for fear of being caught by the police. By the time he was in his early 30s, he had been introduced by a mutual friend to the woman he would marry, Ms Sulastri Embit, 49, who is also his business partner. "I didn't want to stay alone all my life, with no family. My mother, who always visited me in prison, was getting old then and I hadn't been supporting her," he says. He found a job as a delivery assistant at a catering company and stayed away from drug-taking acquaintances from his past. After struggling for several years with alcoholism - he says he substituted drugs with alcohol - he set up his catering business in 2004. It has been 17 years since he has been drug-free, but Mr Mohamed Nor says he still dreams about drugs sometimes. His family keeps him on the straight and narrow. "When I look at my wife and kids, I think about what I have," he says. He is open about his chequered past with his two children, Muhammad Ryan Amani, 12, and Nur Iman Qistina Amani, eight. Ryan says: "He does not want me to do the same things he did." Mr Mohamed Nor says: "I want to show others that drug addicts can change." After Mr Suhaimi Rafdi's first wife died of cancer in 2003, he continued his journey towards a goal they had shared: having a big family. Mr Suhaimi, 50, is the youngest of four children and his late wife, Madam Maureen Hoeden, also came from a huge household. "It had always been our wish to have a large family. I felt there was more bonding among the siblings. Four would be a right fit," says Mr Suhaimi, who works as a director with People's Association, overseeing Our Tampines Hub, an integrated community and lifestyle hub. He and his late wife have two children, George Michael Suhaimi, 30, who works in sales, and Vanessa Anne Suhaimi, 24, a marketing professional. Widowed in his 30s, he adopted two babies on his own, Nur Nabila Suhaimi, nine, and Muhammad Nabil Suhaimi, eight. He wanted to provide a good life for them despite being criticised and questioned for adopting two children as a single father then. Also, having a large family felt emotionally right, he says. At the time, he was travelling about two weeks every month. He held a demanding job as chief executive officer at Cathay Organisation Holdings and was a prominent player in the entertainment business. He worked there for about 20 years before taking up his current job a few years ago. His aunt, sister and two helpers helped him care for the four children when they were younger. After he was widowed, Mr Suhaimi was not sure if he would remarry given his packed travelling schedule. He wanted to devote his attention to Vanessa Anne and George Michael, who were about 10 and 15 when their mother died. About six years later, as the two older children were busy with school, he felt the home would be "re-energised" with the arrival of Nur Nabila. He later thought that Muhammad Nabil, adopted a year later, would make a good companion for Nur Nabila. About 18 months apart in age, the pair are close and often wait to have lunch together after arriving home from their respective primary schools. 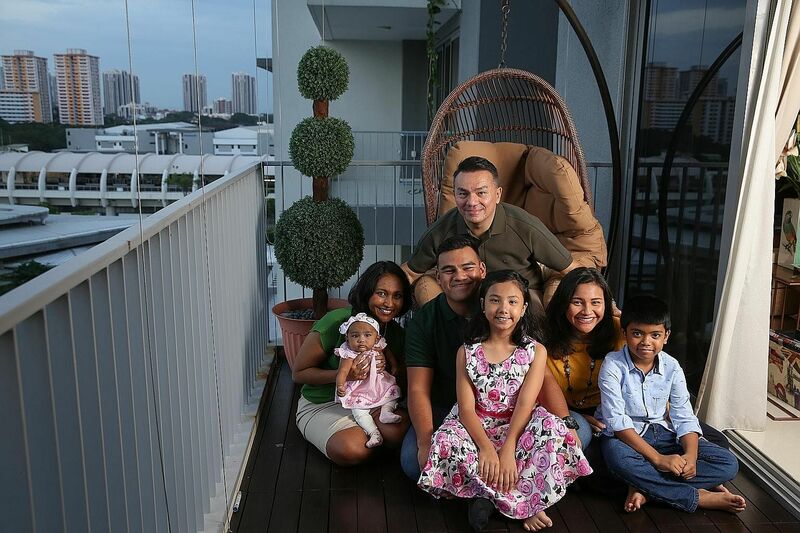 Mr Suhaimi says he loves children and enjoys bonding with his family over cooking and eating. He often cooks dishes such as rendang and curry devil with his two oldest children on weekends. He remarried in 2016 and his wife, Ms Nazimah Mohamed Ramdzan, 40, a regional supply-chain manager in the cosmetics industry, gave birth to their daughter, Nadine Sophia Suhaimi, three months ago. "Now, the family's complete. It's always bustling. It's a full house," says Mr Suhaimi. Their fifth child is "the cherry on the cake", he adds.